So I'm not sure if you've noticed, but the weather is starting to get a bit warmer again. This tends to make me a little excited, how about you? It's definitely inspired me to write about a collection that screams summer. 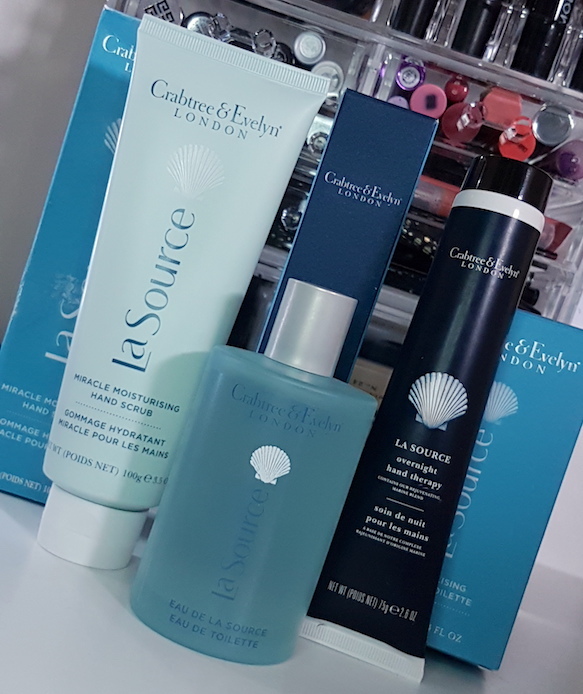 Crabtree & Evelyn have recently re-formulated products within their sea-inspired, La Source range. This re-formulation sees the introduction of four new marine blends that each contain the new “hero ingredient”, Green Seaweed Extract. In each, the Green Seaweed Extract is combined with a specific Marine-Based ingredient to “boost skin benefits”. Refreshing Marine Blend - this blend includes Brown Algae Extract in addition to the Green Seaweed Extract. It provides moisturising, cleansing and purifying actions. Hydra Marine Blend - Blue Sea Lavender Extract works alongside the Green Seaweed Extract in this blend for a nourishing and purifying effect. Restorative Marine Blend - Red Sea Algae Extract and Green Seaweed Extract make up this blend that is designed to be protective on the skin. Rejuvenating Marine Blend - Sea Fennel Extract combines with the Green Seaweed Extract in this final blend that lives up to its name, acting as a rejuvenating combination. and the Hydra Marine Nourishing Oil. Today I have three products from the collection to show you, including the new Eau de La Source EDT. Alongside that, I have the Miracle Moisturising Hand Scrub and the Overnight Hand Therapy Cream. I'll go more in depth on each of the items below rather than here, and review them at the same time. You can also find information about where to purchase any of the La Source items spoken about within this post at the end. The Eau de La Source EDT is essentially the scent of the collection. All of the products within the range carry this scent. With that said, this EDT does also come infused with the Green Seaweed Extract for its anti-oxidant properties and is free of phthalates and propylene glycol, so there are added benefits here too. It is described as an aquatic scent that is designed to take you away to “experience the tranquility of deserted shores”. 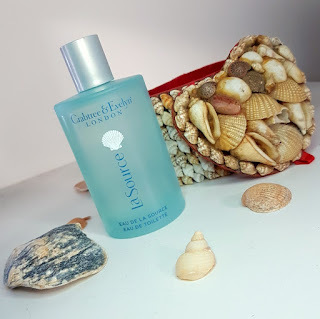 In addition to the marine aquatic accord, it states that it also boasts an ozonic accord along with citrus, golden amber, petitgrain and basil notes to create a overall experience of a “spa-like scent of crisp ocean breezes”. Aquatic is something I will agree with. Think along the lines of Davidoff's Cool Water and it's flankers, but not for too long. It begins life as more of an aquatic fruity floral, but as it settles I find it to be more of a musky, herby aquatic. It settles down fairly quickly, too, so if you're after the fruity freshness that can come along with some summery scents, you may not find what you're after for too long after the initial burst of citrus. Personally, I love it. I think that so many aquatic fragrances can end up smelling almost "post shower" fresh, with the fruits and the flowers and such. Don't get me wrong, I love that type of scent too in the summer. There's just something so refreshing about a spray of something such as Ralph by Ralph Lauren or Cool Water on an incredibly hot day, but they tend to also carry that level of, for lack of a better word, “immaturity". I don't mean that in an insulting way whatsoever, but this fragrance has more of that grown up sort of edge to it instead. It is less of a beach, nightlife holiday and more of a lying in a hammock on your own personal island, reading a good book and sipping cocktails type of scent. Sillage wise it sits fairly closely to the skin, but you can catch a faint whiff if you spray enough and you move around, more so if you also spray some into your hair (which with this fragrance, you can). In regards to longevity, you're looking at around 15-30 minutes of the opening, and around 4-5 hours of the musky aquatic scent. The Miracle Moisturising Hand Scrub is a pretty self-explanatory product. It is designed to cleanse, exfoliate and moisturise in one step. 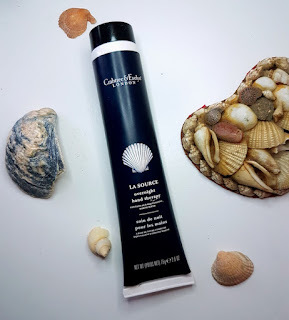 It contains the Hydra Marine Blend (Green Seaweed Extract and Blue Sea Kale) along with palm butter and macadamia nut oil for moisture and three varying sizes of salt crystals and pumice granules for gentle exfoliation. To use, you need to apply a small amount to dry hands and massage it into the skin. After a short while, you need to rinse your hands thoroughly. I found that this worked from the very first use to help soften and smooth the skin on the hands. Admittedly it did feel a bit weird at first using a scrub on the hands, especially between the fingers and on the palms, but it works wonders! The gritty pumice exfoliates are close to what you would find in a body exfoliator rather than a facial exfoliator. They’re rougher than what you can use on the face, but gentle enough to not tear the hands to pieces. If you have super sensitive hands or a skin condition such eczema on our hands, you may not want to try this scrub as it can be pretty irritating on sore skin. A slight dryness on the skin should be find to use it on, but if it’s dry to the point that it’s cracking, for example, then maybe not so. I began using this once a day, just before bed (and just before the Overnight Hand Therapy cream that I’ll be discussing next), but it doesn’t need to be used this often at all. Using 2-3 times a week is more than sufficient to keep the skin on the hands feeling soft and smooth and also prepped for hand cream. The only issue that I really have with this scrub is that it comes in a bottle that could hold more than it does. This gives it that air of always feeling half full, which can be a bit confusing when you have only used it a couple of times. You pick up the tube and it feels really light, like you’re already half way through using it, and you start to wonder if you’ve been really flying through it. It’s an odd criticism, I know, but it has caught me off guard a couple of times for sure. If you are concerned about keeping your hands in top shape, then I highly recommend trying this scrub out. Night time is when our skin naturally begins to recuperate from the days stresses. This is why it is a good idea to use night creams and such to aid the skins healing and regenerating process. Think of the Crabtree & Evelyn Overnight Hand Therapy as a night moisturiser for your hands instead of your face. The richly formulated cream contains the Rejuvenating Marine Blend (Green Seaweed and Sea Fennel Extracts) as well as a highly concentrated blend of vitamins, arginine and amino acids. The complex works to improve the skin barrier, retain moisture and ease and soothe dry areas. I applied this straight after the Miracle Moisturising Hand Scrub every night since receiving it. Upon first use I was somewhat expecting it to leave a sort of greasiness on the hands like a lot of other highly moisturising hand creams tend to do. However, I was wrong. I found that it absorbed fairly rapidly and instantly left the hands feeling soft. In the morning, my hands felt soft, but after washing them they felt the same as always. The next night, I decided to try using a bit more. It was at this moment when I began to notice that it didn’t absorb as quickly when more was used, but still not to the point where it was as greasy as other hand creams. When I awoke the next day this time, my hands felt far softer and looked incredibly smooth. I would recommend using a little more than what you may use with other hand creams, just to the point where it leaves a slight greasiness on the hands, but not an overwhelming amount. This amount seems to be the perfect dose to use and I have been loving this cream immensely. 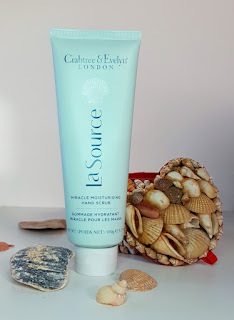 I do also recommend using it in conjunction with the scrub, but for extra protection it could be worth using a daytime hand cream still too (and yes, there is a day time Ultra-Moisturising Hand Therapy cream as part of the La Source range too). Overall, I’ve been thoroughly enjoying these items from the La Source range. The Eau de La Source EDT is a beautiful addition to anybodies fragrance collection, particularly if you love fresh scents that evoke a relaxed mood that makes you ready for summer. The Miracle Moisturising Hand Scrub and the Overnight Hand Therapy cream is a duo made in heaven for those who like to keep their hands in great condition. 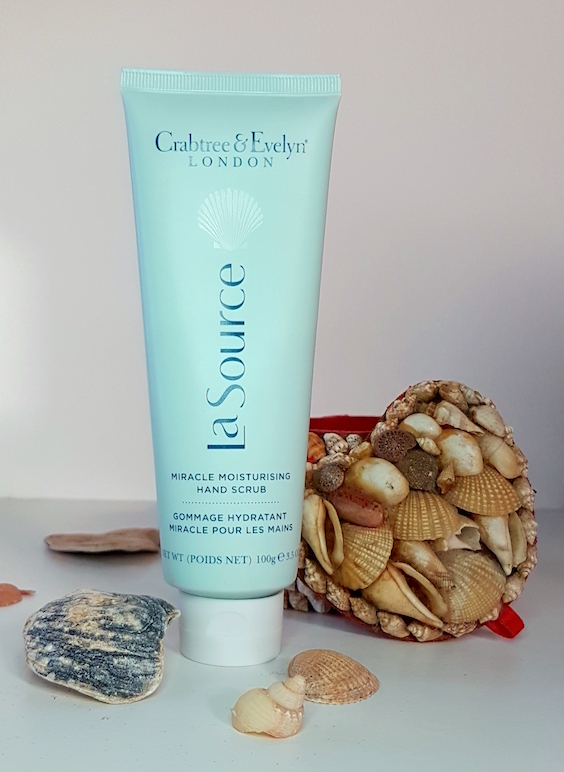 As well as the additional Ultra-Moisturising Hand Therapy cream, the La Source collection also boasts a Nail & Cuticle Therapy too, so you can have the full, all round experience if you want to indulge further. You can purchase the La Source collection from Crabtree & Evelyn. What are your thoughts on the La Source collection? What item most takes your fancy? *These products were sent to me as review considerations. However, this hasn't in any way affected my review with all thoughts and feelings about the products being 100% my own.